Thank you so much for the wonderful service you gave to my family. I have been to many funeral homes. Yours is beautiful. The architecture is amazing. My thanks come especially for the care you gave to my family members. You were so kind. Never have I seen a more attentive staff. Many people think that Staab Funeral Home started in one place. It actually didn’t. From 1927 to 1937 George J. Staab owned a funeral home in partnership with John O’Donnell called O’Donnell and Staab Funeral Home. The funeral home was located at the corner of Seventh and Vine Street, about three blocks away from the current location. In 1937 the partnership between O’Donnell and Staab was dissolved. 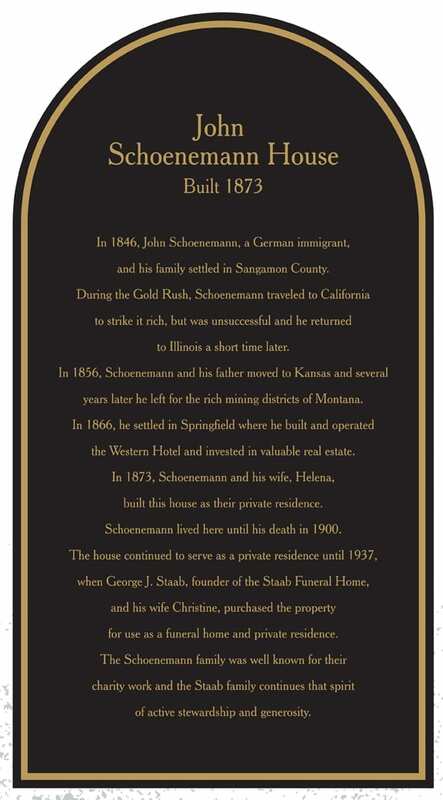 That same year George Staab and his wife Christine started a new funeral home called Staab Funeral Home. This was the first generation Staab Family. 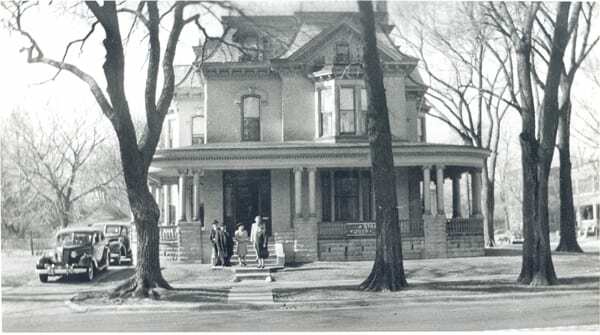 Staab Funeral Home – Springfield is now located at 1109 South Fifth Street in a comfortable Victorian style home built in 1873. In the early years it was a struggle to raise five children and start a new business during the Great Depression. In the first year alone 1937-1938, they served only nine families. A payment concept frequently used was called bartering, using an exchange of foods or other goods to pay for funeral services. From 1937-1942 the funeral home was rented by the Staab Family. By 1942 enough money was saved to buy the building. The building was not only used as a funeral home but as a private residence for George and Christine and their five children. By the late 1940s the five children: George Jr., Marie, Paul, Vincent, and Catherine were increasingly active in the daily operation of the funeral home. In 1950 the first major addition of the funeral home was designed and built on the south side of the building. By the mid 1950s the number of families served was continuing to increase. Paul married Jean Reichart and began to raise his family of seven children over the next decade and a half. At this time there was one first generation funeral director who was George. The second generation had two embalmer/funeral directors who were George Jr. and Vincent as well as four funeral directors: Paul, Jean, Marie, and Catherine. The number of families served continued to increase requiring a large second addition to be designed and built in 1960. This addition included their first modern embalming room along with other special features to serve families better. Again, the number of families continued to increase. In 1961 one of the first generation principals, George Staab, died. Following George in death was his wife Christine Staab, in 1973. In 1983 a second generation principal died, Marie Staab. In 1982 the largest of the three additions was created on the west side of the funeral home to provide a more comfortable atmosphere for client families. An increase of government regulations required Staab to provide handicap disability features such as an elevator, ramp, and even hearing impaired devices to be installed. By the late 1980s the way funeral service was conducted had changed a great deal since the firm was founded in 1937. The funeral home now became computerized and more consumer oriented to meeting the needs of the client families. In 1991, another second generation principal died, Paul Staab, leaving his children to help run and flourish the business. One of the most drastic changes in the facility was a state of the art embalming facility in three distinct different stages. The plans for the room were shown in Spain at an International Funeral Directors’ Convention. After five years of research in 1995 it became reality. Vincent Staab passed away after many years of service to the firm in 2002 and in 2005, George J. Staab Jr., another second generation principal involved with the business operations of the earlier years died. In 2014, Staab purchased a building and land in Sherman, Illinois on Andrew Road. This building was acquired so that it could be converted into a second location for Staab. In 2015, extensive work began to rehabilitate the building to make it suitable for the demands of a funeral home. It was originally and office building for the Sangamon County Sheriff’s Association. As with most offices, it was closed off and with the renovations we were able to open the floor plan to make it more comfortable and more spacious. The beautiful decor, both inside and out, is a very fitting place to offer tribute to your loved ones. We opened our second facility in 2017 and look forward to many, many years of service to the Sherman, Williamsville, Athens and Riverton communities. While we’ve a great past few years, we did suffer another loss in our family. The last of the original Second Generation Staab Family members, Catherine L. “Aunt Catherine” Staab, passed away at the marking of our families 80th year in business. What she, her parents, brothers and sister did for our community will never be forgotten, and will be remembered for years to come. The Staab Family mission continues with the Fourth Generation of the family joining the ranks and learning from the generation before to ensure that there is always a funeral organization that fulfills this statement”…serving others as our own, while providing a meaningful service of life”.